Manufacturing environments and trade show floors present notoriously challenging communication environments. Whether your goal is leading a tour or conducting employee training, your audience will hear more of your message if you provide them with a high noise headset from TourGuide Solutions. TourGuide Solutions, a tour guide communication system industry leader, offers a range of high-quality options from a variety of manufacturers. 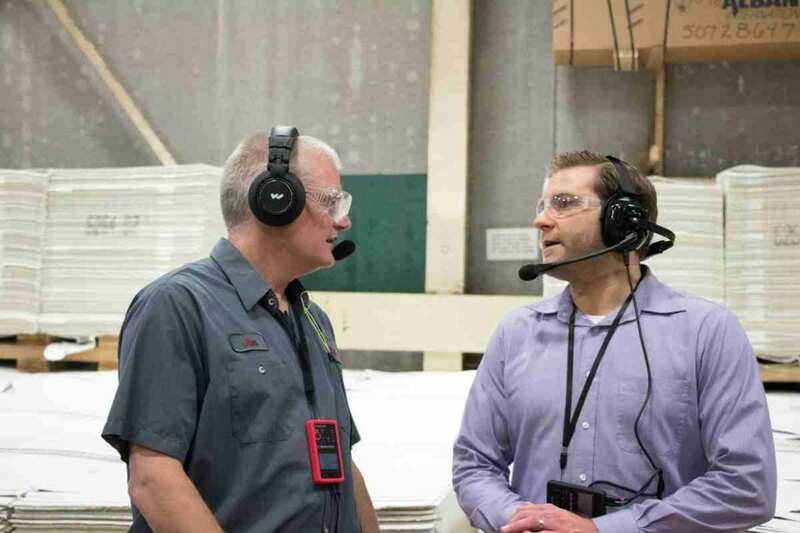 High noise headset models are designed to improve the effectiveness of communication without sacrificing comfort, including instances in which OSHA regulations mandate hearing protection and hard hats. The noise reduction rating (NRR) is a measure of how much environmental noise a particular high noise headset protects from the wearer’s ears, expressed in terms of decibels. MIC 088 – A dual-muff headset and microphone designed for use with a hard hat, this high-quality unit includes a microphone and is made for use with the Williams Sound DLT 100 transceiver. It is ideal for noisy environments with an NRR of 24 dB. Hard hat compatible. MIC 068 – This heavy-duty, dual muff headset from Williams Sound includes an NRR of 20 dB and unidirectional microphone for exceptional comfort and safety. This model is designed for use with the Digi-Wave and iC-2 product lines. LA-454 – This Listen Technologies headset features a boom mic and incorporates dual over-ear speaker design with an NRR of 14 dB for increased clarity in high-noise environments. LA-455 – Another exceptional headset from Listen Technologies, this model is perfect for loud industrial environments where clear communication is essential. Its NRR of 20 dB comes from its dual, over-the-ear speakers. Hard hat compatible. HDE 2020-D – Background noise is no match for the Sennheiser Stethoset Tourguide receiver. Paired with background noise cancellation technology from the microphone transmitter, this truly unique device integrates both the receiver and headphones and delivers a number of advantages for you. Contact TourGuide Solutions to learn more about how a high noise headset can benefit your organization. TourGuide Solutions offers warranty protection, with post-warranty care standard with every purchase. Next-day service is available to locations within the United States. Call 877-204-0225 or visit http://tourguidesolutions.com for more information about TourGuide Solutions products or to request a quote.